Aspiring sportswriter Jordan McAllister never imagined she’d end up as a food critic for a small time newspaper. Writing the culinary column for the Ranchero Globe is a challenge, and even though she can’t make a grilled cheese sandwich without burning it, she has no trouble finding herself in hot water. When Rosie LaRue finds her ex in the apartment with her ice pick in his chest, Jordan knows that she and the Empire Apartments gang must act quickly to keep their friend out of jail. Despite the fact that the deceased has a long list of people who wanted him dead, things aren’t always what they seem, and Jordan ends up in the hands of a crazed killer, desperately searching for a way to stay alive. I really love this series. Jordan is a girl after my own heart but I can cook just a little bit better than she. This little novella puts Jordan’s friend Rosie in the hot seat when her ex is found dead on her couch. Thankfully her friends have her back and find several more suspects for the police to pursue. Liz Lipperman is one of my favorite authors. She creates delicious characters and puts them in dicey situations. She always adds a good scoop of humor to her cozy mysteries too. While this book was about half the size of her normal mystery nothing was left out or felt rushed. As a fan of this series I am familiar with the recurring characters so I had no trouble putting everyone in their place. She does give enough background to read it as a stand alone. 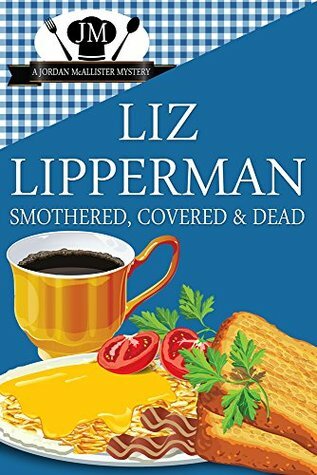 I am thrilled the Liz has taken the self-published route to continue the Clueless Cook Series, with Chicken Caccia-Killer and now Smothered, Covered and Dead as the Jordan MacAllister Mysteries. If you like this one I encourage you to go back and read the rest. Be sure to check out the recipes too! To keep up with Liz and get information about all her book please visit her webpage here.